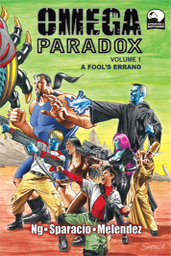 "Omega Paradox: A Fool's Errand"
"Omega Paradox: Vol 2 Teaser"
How about our brand new online store? Vol. 1 #1 - "Free Falling"
Vol. 1 #2-3 - "Temple of your Dreams"
Vol. 1 #4 - "It's Not the Fall that Hurts"
Ian Ng took a long break from comics. Although he was an avid reader and sometime collector in his youth, he gave up his dream to be a comic creator when he left high school, instead to pursue a more pragmatic career in engineering. Pragmatism, while useful, is boring. After over a decade of pursuing a BSc in Chemical Engineering at Cornell University and enough expired Microsoft certifications to make alphabet soup in Information Technology, he finally turned back to his love for comics and movies. In 2006, he co-founded the Last Minute Poetry Club, a group of writers, primarily focused on screenwriting. Through this group, he cultivated his writing skills until the fateful day he and Mark created the concepts that would eventually become OMEGA PARADOX. Residing in Los Angeles, CA, Ian eats everything, sings poorly in the car, and insists on spelling words in "the Queen's English." Ian is the writer and editor for OMEGA PARADOX, which he co-created with Mark Sparacio. Mark Sparacio studied sequential art under the legendary Will Eisner at the School of Visual Arts in Manhattan. While still in school, Mark received his first professional job to do a painting for the movie poster for THE DRAUGHTMAN'S CONTRACT. This opportunity resulted in a long run as a freelance illustrator for the advertising industry. When the market for illustration in New York collapsed after 9/11, the door opened for Mark to return to his first love, comic books. His cover credits include Billy Tucci's SHI, DC's GREEN LANTERN and SGT. ROCK, Marvel Comics' HEROES FOR HIRE, COMICS BUYER'S GUIDE, ALTER EGO, COMICS VALUES ANNUAL, and THE OVERSTREET PRICE GUIDE. Mark's interior work includes JONAH HEX #34, CAPTAIN ACTION, and BATTLE FOR L.A.. He also created paintings for card sets for UpperDeck/DC Comics and for Topps' Wacky Packages and Garbage Pail Kids. Constantly developing new ideas and creating the corresponding artwork, Sparacio lives with his wife, Susan in Boca Raton, FL. 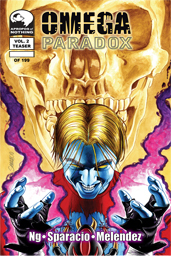 Mark is the penciler and cover artist for OMEGA PARADOX, which he co-created with Ian Ng. Abraham Melendez Rivera was born in Brooklyn, NY. He earned a BFA in Graphic Design from St. John's University, which led to his first professional job on the webcomic RIP AND TERI by T. Campbell. Inspired by the events of 9/11, he left his dream behind to go to war. He finished two tours in Iraq, spending 36 months overseas. Upon Abe's return ot the States, he still had the passion for art and comics. He relocated to Boca Raton, FL, where he met Mark at an anatomy class at Digital Media Arts College. Based on his interactions and the strength of his portfolio, Abe was brought on as the colorist and letterer. In addition to working on OMEGA PARADOX, he is also working on his second BFA in Animation at DMAC.